The Apuan Alps, an ideal destination for nature lovers, are a real gem from a naturalistic point of view. This mountain range is recognizable for its deep valleys, and the imposing and very skewed slopes. The Apuan Alps are famous for the quarries from which the precious marble and other decorative stones are extracted. This wonderful mountain scenery overlooking the sea is also the backdrop to the beautiful beaches and resorts of Versilia, such as Carrara, Massa, Pietrasanta and Camaiore. This charming mountain range thanks to its exposure and to the different nature of the rock presents diverse and contrasting environments, which favour the development of flora and fauna of the area, which is full of both flowers and rare plants and of several species of animals, including the Golden Eagle, the Wild Boar, the Screech Owl and the Shrike. Among the major mountains of the Apuan Alps are: the Monte Pisanino, the highest peak of the Apuan Alps which rises at the border of the province of Massa Carrara and Lucca; and Pania della Croce, the highest summit of the Group of Pania, a remarkable point of interest from scenic, geological and mountaineering. point of view. 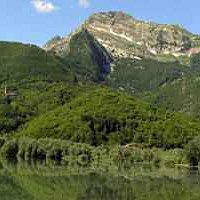 Visited by many tourists each year the Apuan Alps offer many opportunities for living the nature and hiking,as well as several historical and artistic treasures. In addition, there are many relevant aspects of geomorphology, including examples of moraines, erratic boulders and fossils of the last glaciation in Würmian period.